Source: The Reason for the Tears by Bobby L. Lindsey, 1971, pg. 77. "Nothing created more excitement in LaFayette than the first day in December, 1837, when the first stage coach came dashing into town with the words "United States Mail" emblazoned on the bright glided panels. Prior to this date, the eastern mail arrived by rider on his way to an over night stop at Tallassee, via Dudleyville and Dadeville...The much envied driver of the first stage to arrive in LaFayette was Willis Johnson. His salary was listed at $5.00 per month, plus board. Source: The Reason for the Tears by Bobby L. Lindsey, 1971, pg. 104. West Point is a city east of LaFayette in Chambers County, Alabama aside the Chattahoochee River. This is to certify that James B. 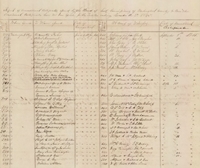 Wells assigned of Willis Johnson has appeared before us the Board of Land Commissioners for the County aforesaid and proved according to Laws that the said Johnson arrived to this Republic prior to the year eighteen hundred and forty two that he was then a married man and having never received a certificate for the quantity of lands for which he applies, is Entitled to Six Hundred and forty acres of land he having proved to us that he has resided three years in the Republic and performed all the duties required of him as a citizen. Given under our hands at Brenham this the 29th day of September 1845. J. 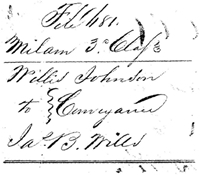 B. Mills/Willis - neighbor to Willis per 1850 slave census for Washington County, pg. 10, in Bell County, Texas in 1856 per tax assessment ,1867 voter registration list for Milam lists J. B Wills as born in Tennessee, 1850 US Census has J. B. Mills in Washington County, Texas and born in Tennessee and married to Anna Mills from Tennessee. A James B. Wills and Anny W. Shackleford were married in Rutherford, Tennessee 3 January 1810. 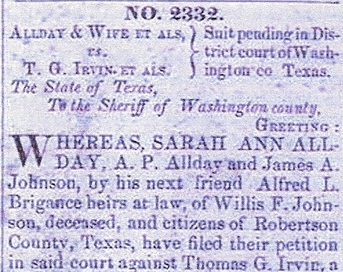 By 1860 Jas B and Amy Wills are living in Bell County, Texas. According to FindAGrave James Buchanan Wills died 2 March 1875 in Milam County, Texas. Some of the claims in this article have been proven incorrect. Lafayette was the county seat of Chambers County, Alabama from 1833 to present. Originally known as Chambersville, name changed to Lafayette in 1835. 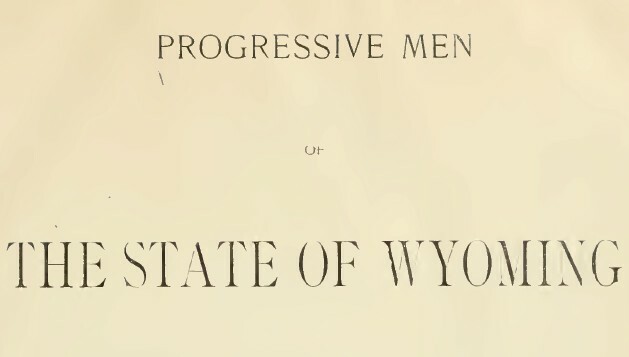 Incorporated in 1835. Post office established in 1875. Description: An old cemetery - the later portion (German) is tended, the older Anglo-Saxon side is overgrown. About 2.5 miles ENE of Greenvine on a gravel road. There are 55 to 60 grave spaces indicated by brick or rock surrounds or rock markers with no legible information on them. Bethlehem Cemetery in south Washington County, Texas, is a cemetery containing persons and their family members who were among the very first Anglo-American settlers to Stephen F. Austin's colony, the "old three hundred". The Allcorn (sometimes spelled Alcorn) family, who have family members in this cemetery, were the second Anglo family to arrive in present Washington County spending the last night of 1821 by a creek they subsequently named with dawn, "New Year's Creek". Bethlehem Cemetery is located on five and three-fourths acres of the original Josiah Lester League in Washington County, a headright league granted to Lester by the Mexican government and later conveyed by him to Erwin Brown. It was Erwin Brown, in turn, who conveyed the five and three-fourths acre parcel on August 13, 1851, to the trustees of the Bethlehem Academy for the purpose of a settlement school and house of worship for the Baptist and Methodist denominations. The first trustees receiving the deed were James C. Crenshaw, James Lane, Leander Burns, Willis Johnson, and I. M. Harris. The site soon also became a "burial place for the neighborhood", as cited in an officially recorded agreement signed April 14, 1873, between the Bethlehem trustees and one J. E. Gray for erecting a fence around the cemetery. The first burial for which there is an extant marker was that of Susan J. Burdett, age 39, who died in 1852 (though Henry Burdett, age about 65, may have died earlier; his tombstone gives only his age and not date of death). Little Rufus Mallets, one of the earliest burials with an extant headstone, appears on the 1860 mortality census (1859 deaths): he died of the "flux" in November, 1859, at the age of one. Also on that mortality census were members of the Armstrong, Crenshaw, Barnhill, Woods, Bowers and Sanders families--- most of them infants, who may have been buried without headstones in many cases. It is a sad commentary on the infant mortality rate of the day to read that census. Bethlehem Cemetery is now a beautiful, spacious, old (and new) cemetery, located on the very top of a high rolling hill that overlooks the Mill Creek valley, home to the earliest of the Anglo-Texans settlers. Some of these earliest of settlers belonged within one lifetime to the Republic of Mexico, the Republic of Texas, the United States of America, and the Confederate States of America-and some a second time to the United States of America. Today the cemetery is in a remarkably attractive condition. Several plots are enclosed still by their original wrought iron fences, standing guard after all these years. The feeling of the cemetery is one of quiet, rural peace and endurance. The cemetery was restored by a group of citizens banded together at nearby Greenvine Lutheran Church March 6, 1988. Donations were taken at this first meeting and one man hired to rid the site of the major obstructions. Then citizens literally lined up shoulder to shoulder and cut their way into the jungle with chain saws. A couple of years prior to that some persons crawling through the brambles, briars, and brush, and snake holes, seeking an ancestor's tombstone, were trapped and got out only by tearing up clothes and skin-the older part of the cemetery had gotten to that state. After the chain saw crews' attack, men, women and children followed up against the brush, weeds, and trash, carefully working around the old tombstones and iron fences. Anyone viewing the cemetery today will have a hard time imagining what it was like three years ago. The Bethlehem Cemetery group makes this application to the state of Texas for a historical marker for following reasons: this is, no doubt one of the more historical cemeteries of the state, both for its location and for the pioneers buried in it; these pioneers gave so much to the Republic and to the state that they are deserving of respect and perpetual remembrance; and a historical marker will contribute toward protecting this site from future neglect and any future vandalism. Present day and future citizens need to know who built this state and where its origins lie; and they need occasionally to stop and visit these peoples graves in this lovely place. Bethlehem Cemetery is today part of what remains of colonial Texas. Milam County Courthouse and all county records were destroyed by fire in April 1874.